US Marines are rare guests in Lithuania. However, this year among those several hundred, who participated in international exercise Iron Sword 2016, one met a Marine colonel, who impressed locals not only by his impressive height and stern look, but also with his name and fluent Lithuanian language skills. For nearly a century, the 23rd November has been celebrated as Lithuanian Armed Forces Day. During the ceremony in Vilnius Cathedral Square, Lithuanian and allied troops gather in columns to commemorate this day. 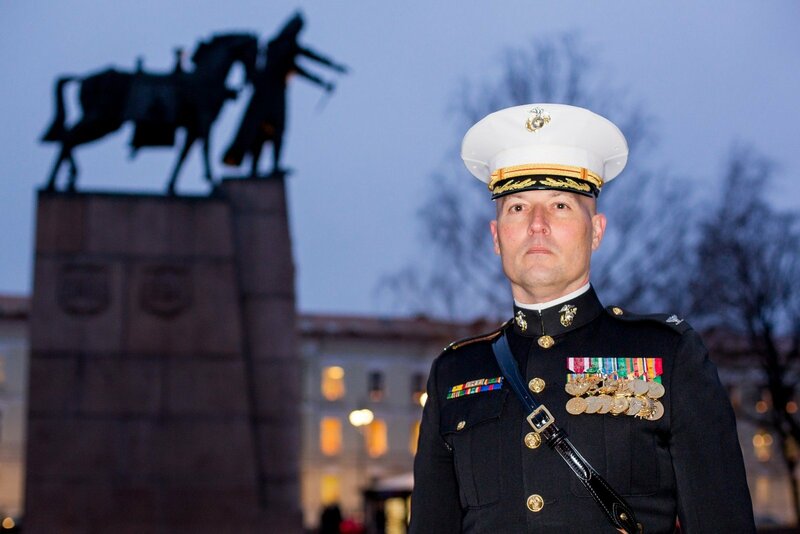 One of those uniformed in formation was no soldier – but a US Marine colonel, Darius Novickis. For many Lithuanians this detail may not be of significance, but to Americans it means a lot – US Marines are not technically soldiers; they are a different branch of the Armed Forces. They have their own budget, ranks, equipment and weapons. They also differ with their culture, history, innovation and aggressiveness in battle. They even look different. It is a very capable, well prepared and disciplined force that is proud of their motto – The Few, The Proud, and The Marines. Some Marines would give you a smile or even take offense if you were to call them soldiers. They are not Army, or Navy, or airmen, they are Marines. Moreover, according to Col. Novickis, there are no ex Marines – there are only those who are, and those who were in uniform. “We are few, so we have a tight bond. We are like a family. For instance, I'm driving my car with a sticker “Marines” on the back. You have a police car signaling me with lights and a cop saying semper fi. We don't care, where he served, whether he was infantry, or tanks, of amphibious vehicles – once you're a marine, you're always a Marine”, - said D. Novickis. 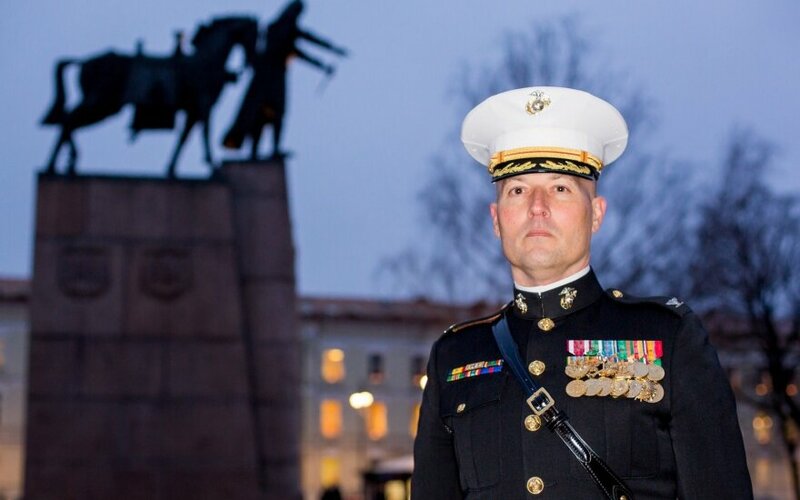 This Lithuanian American is a Marine Forces Europe executive officer, who works in Germany. He considers himself Lithuanian – he speaks Lithuanian fluently, he can also write and read in one of the oldest spoken languages on Earth, which is rather difficult to master. “I haven't been to Saturday school or anything, I was taught at home by my parents”, - he proudly says. He came to Lithuania, homeland of his parents and grandparents about a decade ago. This year he even brought his dad and mom to Lithuania – former refugees, who at the end of the Second World War had to leave their homes, fearing the Soviet onslaught. They left for Germany and then for the United States. It was the first time since 1944, that they had a chance to see their completely changed homeland. “My grandfather Antanas Novickis was a lieutenant colonel in the Lithuanian army back in the 1920s. He was awarded the medal of the Vytis Order. He later became an architect and designed several buildings in Kaunas. We went there and actually saw those buildings still standing. My mom’s family is from a little town called Zarasai. We went to the museum there and she saw a black and white photo at the exhibition. She recognised nearly everyone in that photo”, - said Col Novickis. His parents first moved to New York and then relocated to California. Their original home is also still there in the Žaliakalnis district of Kaunas and they have never forgotten Lithuania. “I have two younger sisters and an older one. We all spoke in Lithuanian at home – some kids even teased me, as I spoke with an accent. I have to appreciate the gift of independence, since Lithuania back then was occupied by the Soviet Union, while I grew up in a free country. Once, I remember, an opera singer came from Vilnius to San Francisco. I showed her daughter around, but it looked like someone was always checking on her, following us. And then I realised that this man was from the Soviet consulate”, - he recalled. It was hard to preserve his Lithuanian identity though. “When I was a kid, I was a boy scout, Vytis, I wore a purple tie. However, in camps all the kids were only talking in English, because it wasn’t cool to talk in Lithuanian. My family felt we were Lithuanians though – my mom used to cook kugel, stuffed cabbage (balandėliai or "little doves") and cold beetroot soup – I didn't like it back then. My parents always thought that Lithuania would be freed. Many thought the same. Why? It's hard to say. My dad’s family even buried some stuff before leaving Lithuania. Even back then, when people were shipped to Siberian gulags, they hoped that Lithuania would be free. It didn't matter whether the Americans would free it, or someone else”, - said the colonel. When he brought his parents to Lithuania this summer, they spent a whole month touring the country. They saw Vilnius, Zarasai, Jurbarkas and Kaunas again. They liked the latter very much. “I showed them around and not just the old town, but the soviet era apartment buildings as well, but they felt like they were at home anyway. When we were at Kipras Petrauskas museum, my mother told the guide she knew the daughter of Mr. Petrauskas. This guide then organised a trip to Vilnius and get in touch with the said daughter. They talked for hours as best friends after 72 years, it was amazing”, - recalled Col. Novickis. His decision to serve was his childhood dream. He saw books with pictures of US Marines fighting during WW2 in Pacific campaign. “I remember I asked my parents, who are those Marines. And they told me – they are the first to fight. You see I grew up in a family that defended Independence with arms, so I guess this was in my blood, so I said it then – I want to serve. It doesn't matter if I am infantry, or driving a tank, I care about Eagle Globe and Anchor. Yes, it's tough to become a marine, the highest standards are expected, but I wanted to serve no matter what. I even wanted to enlist at 17, just before finishing at the Jesuit gymnasium, but my mom said no – you gotta try and study. If you don't like it, then you may enlist. So I did – I graduated from UCLA and then joined the Marines in 1989”, - said D. Novickis. After six months of basic training, he decided to become an officer. He managed to do so just in time – in August, Sad’am Hussein invaded Kuwait and second lieutenant Novickis, and commander of AAV-7A1 amphibious assault vehicles was one of the first officers to join the US led coalition war effort to take back Kuwait. When the Coalition deployed troops and equipment to Saudi Arabia, Novickis was one of the first to be sent in. There he met his battalion commander – then Lieutenant Colonel James Mattis, who is due to become the Secretary of Defence under the Donald Trump administration. “I remember him as a tough commander, but also as a gentleman”, - said Col. Novickis. Now a Marine General, Mattis is considered a legend, known for his nicknames – Mad Dog, Warrior Monk and Chaos. He is also known to be a cunning, aggressive commander, well read and frank. He never had time for a wife, so they say General Mattis married the Corps. “It's no coincidence; he's called a Warrior Monk. He respected every Marine, we trusted him unconditionally. Of course, I was just a young Marine lieutenant and he was the battalion CO. I recall one time when I had to wake him up during the night and inform him of the incoming “Scud” missile – I was the duty officer that night. He reacted calmly, thanked me and told me to inform the others. We knew he would take us off the road. Even when we thought we're going to take huge casualties, at the beginning he showed us the map – 23 Iraqi divisions against our one. But he managed to boost our confidence”, - said Novickis. During Desert Storm, he had time to remember his Lithuanian roots – he even painted the Jogaila Cross on his helmet and wrote “sveiks” (hello) on it. “I still have that helmet in my home in California. Then, I remember, I heard the news on the radio about what was happening in Vilnius, on 13th January 1991 – the Soviets have killed Lithuanians near the TV tower. Then it stunned me – Lithuania was going to fight a war against the Soviets and me – what was I doing here in the desert? But already on the 17th the sergeant had informed me, that the war has begun here. We were just at the border. So many aircraft – fighters, bombers and they were all bombing, we heard them all”, - said Col. Novickis, remembering his first combat experience. It was only the beginning of the aerial campaign, which lasted for about a month – Iraqi forces took a real bashing and it demoralised the troops. At the same time, Novickis and other Marines used their time for continuous and rigorous exercise, preparing themselves for possible chemical attacks by the regime forces. Finally, the ground operation began. For Col. Novickis’ Marines, it started with one tank setting off a mine just after crossing the border. “It didn’t blow up, just the track ran off, but we had to stop for a while. Then we moved with great speed and met many of the surrendering Iraqi troops, who were waving white flags. On the third day we reached Kuwait city”, - he recalled. Like many US ground forces, Novickis didn't even have a chance to fire his weapon. The only time his Marines came into contact with Iraqi troops, was an ambush by two Iraqi APCs. “I was already ordering to launch “Dragon” antitank missile we used at the time, but then two Marine Cobra gunships came and destroyed the targets”, - he said. The Gulf War was a relief for the US and it spiked a patriotic mood back at home – US servicemen were met with parades, like heroes. To Novickis it seems as a payback for all that the US servicemen had to endure during and after the Vietnam War, when the vets used to be scorned. “After the Gulf War I came back to the US, and then I was deployed to Okinawa, Japan. Then I went to Somalia”, - he recalled. US Marines were one of the first Americans to disembark on to Somali soil during operation “Restore Hope”. The operation started awkwardly as journalists knew the exact time and location of US landing sites and waited for the Marines with cameras. It didn't end well either, as it was later better known for the infamous “Blackhawk Down” incident. “I wasn't the first to arrive. We were coming on a plane and I remember it was funny, as we were flying to Somalia with “Pleasant Hawaiian Holidays“airlines, while our equipment was being transported on a ship. Later we had to patrol Mogadishu, there was some fighting”, - he didn't elaborate. Later, after transfer back to the US, he followed the footsteps of General Mattis – he worked at the recruitment center in California and was Deputy Commander, responsible for about 100 servicemen and women. Eventually after his contract ended, he moved to the Marine Reserve and worked in the private sector for a while, but came back for duty in 1999, when he started working with Marine Public Relations at the Motion Picture & TV Liaison Office in LA. Then a Major, Novickis had to evaluate Hollywood movie scripts. Hollywood producers were only eager to cooperate with USMC, as they wanted to be consulted on military issues, get their hands on marine equipment and training. Novickis helped with “Bourne Identity” script. He was humble about the issue. “That's one of my favorite movies. It'd be an overstretch to say I helped to make that movie, but I added some corrections, so that the Marines would look real”, - he smiled. But the smile ran away from his face on 11th September 2001. “Probably everyone remembers where they were on that day. I requested to be reinstated to active duty at once. Eventually I was assigned to be a White House liaison officer. I told the general, Sir, every Marine will carry his assignment, but you do know I am not a PR officer, right? Because I only worked this job, I never studied PR, I was amphibious assault vehicles commander. Eventually, I was transferred first to Pakistan, and then to Afghanistan, to the Bagram airbase. I was tasked to be the liaison between the State Department, the White House and the Embassy. Whenever someone came from the White House, I got to plan the visits etc.”, - he said. Already in 2002, there was a Lithuanian Special Forces detachment, working from Bagram airbase, but Col. Novickis did not meet his Lithuanian counterparts. He, however, had a friendly relationship with the Royal Marines. This, ironically, helped him to make the decision to come to the homeland of his parents. “After Afghanistan I really wanted to leave the PR and go back to an armored unit. Not only did I go back, but I also went to the tank battalion where I became Abrams Company Commander and latterly – Battalion XO. In my free time, however, I was in contact with the British Marines from Afghanistan. Once I decided to go to visit them in England. I did that several times and one day before my trip to London, I thought; here I am traveling around the world, but have never visited Lithuania. Why not? So I bought a ticket and here I am sitting on a “Lithuanian Airlines” plane. Nearby two Lithuanian guys drinking beer asked me how I knew the Lithuanian language so well. This is how we got to know each other”, - he recalled. Once on Lithuanian soil in Vilnius he went for a walk. It was late evening and he was alone. “I remember, I was walking down Pilies Street from the station to Cathedral Square and I had this feeling which I cannot explain”, - he struggles with his words. After the first trip, he made many others and even tried to reclaim his parents’ home in Kaunas, but legal procedures turned out to be too complicated and not worth the effort. He's not sad though – coming back to Lithuania often he has got to know Vilnius very well – he has his favourite places, he reads local news and he knows of the Lithuanian worries over the US presidential election. However, unlike many Lithuanians, Novickis isn't that concerned about US President elect Donald Trump and his possible actions. Controversial claims by Trump and his ties to the Kremlin as well as Russian propaganda’s praise for the elected leader has cast many doubts and even fear, that the United States will give up on its obligations to defend Lithuania and other Baltic states in the time of need. Avoiding the political discussions Col. Novickis was clear, that no one should doubt US resolve on the issue. “I can speak as an officer. If you cannot trust the allies, that is bad. But on Lithuanian Armed Forces Day I listened carefully to the speeches of the Lithuanian President, the Minister of Defence and the Commander of the Armed Forces were giving – they all mentioned the allies, and stressed their role and importance. The exercise Iron sword, where you have several hundred US Marines, happens so we could have better interoperability between the forces from different NATO countries. It's important that this cooperation continues”, - he said diplomatically. As for Trump, Col. Novickis reminded, that even President Obama has expressed his opinion that the new president will continue with its obligations to NATO allies. “While President Grybauskaitė said, that it doesn't make a difference, who runs the administration – the relations between the United States and Lithuania are important, we trust America and its people. I think the same”, - concluded Col. Novickis.